Don't you just love to personalize your holiday gifts? JustRite makes it easy with all the new holiday images and the coordinating fonts! I created a personalized gift card holder (see template/directions I created here) using the JustRite Holiday Demi Phrases, Times New Roman 15 point Font, and A Merry Little Christmas Borders & Centers. 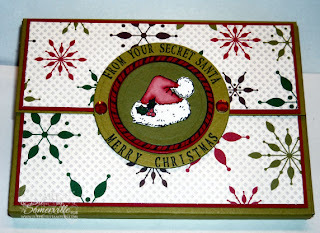 I created the box out of Kiwi Kiss card stock, added a Red panel and some Merry Moments DSP from Stampin' Up!. To create the sentiment, I used the 2" Wooden Stamper, "From Your Secret Santa" from the Holiday Demi Phrases (note I cut off the curly things), and added Merry Christmas using the Times New Roman 15 point Font. I stamped this in Black on Kiwi Kiss card stock and cut the circle with the Big Shot and Spellbinders Dies. To create the other elements on my tag, I stamped one of the borders from A Merry Little Christmas in Black using the 1-5/8" Wooden Stamper on Red card stock, cut with Spellbinders Circle Die. The Santa, also from A Merry Little Christmas, was stamped in Black on Watercolor paper, colored using the Marker Watercoloring Technique and Spica Glitter Pens, cut out and adhered to a Olive circle. After layering all elements of my tag, I added some Gems from Kaiser. Only the top 1/2 of the tag is taped the the box, I used Basic Grey Magnet Snaps to keep the box closed. Very cute, can't believe it's getting to be that time of year again. I need to get a jump start on Christmas and definitely need gift card ideas. Cute holder. Love the colors, and it's JustRite! This is very cool, Lisa. I'm going to have to study it. I love to give gift cards! 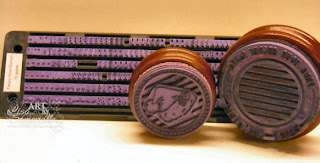 What a neat project and it the JustRite stamps sure made it possible. 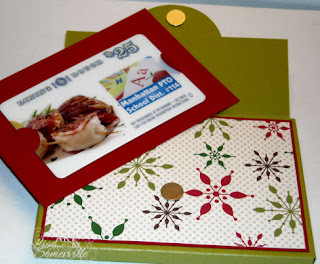 What a cute gift card holder idea -- love the box, Lisa! you really have a flair for these gifts! nice job, as usual! Just darling, Lisa! Making gift card holders is one of my favorite things to make -- great job!!! How handy is this gift card holder! Pefect, Lisa!